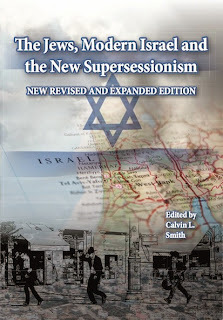 Calvin L. Smith: Brief Review of "Zion Before Zionism, 1838-1880"
I am also fascinated in tracing how the land has changed under Zionism over the past century or more, from a land that was, to all intents and purposes, desolate under Turkish Ottoman rule through to a highly agriculturally productive land today. For this reason, I am also very interested in 19th century travel accounts of the Holy Land, as well as photographs from that period, which can be particularly insightful. I do not intend to offer a full review of Blumberg’s historical monograph here. His basic aim is to narrate how in 1838, after many centuries of non-Muslims being prohibited from owning or even leasing land with a view to permanently residing in Jerusalem, this policy was eventually relaxed for certain reasons, permitting a small influx of consuls representing the Great Powers. Over the next four decades or so, these consuls eyed each other suspiciously, jostling for power and privilege within a decaying Turkish Ottoman Empire which ruled Palestine (likely envisaging her inevitable decline). The establishment of consuls also set the scene for later immigration to the Holy Land, now that citizens of respective countries now enjoyed consular protections. Blumberg’s narrative is well written and impeccably sourced with a substantial array of primary sources, and as as an historian I’m sure peers will feel this is a good piece of historical writing worthy of consideration and engagement with. This is all I need say from an academic perspective about the book. Thus, to all intents and purposes, this is not really an academic, objective book review. Rather, aside from acknowledging Blumberg’s central thesis and the scholarly nature of the book and its methodology, there are several facts on the ground in mid-19th century Palestine raised by his book raises that cast light on the current Israel-Palestinian crisis, which I want to discuss briefly, and which, I believe, those Christians who want to support Israel both from an historically-informed as well as a biblical theology perspective, might find useful. First, Blumberg echoes other historical studies which highlight how the land in the 19th century was pretty much desolate. For example, he describes how most of the woodland had long since been cut down by the Bedouin, exposing topsoil which was eventually washed away, thus leaving the gaunt, stark limestone hills exposed to the elements. Driving from Tel Aviv through the hills up to Jerusalem today, you can still see such exposed hills of white limestone. Some of them now contain areas of woodland, mainly Mediterannean conifer, scattered about them, some of it quite thick and lush. (Yet these are not particularly ancient trees. You can tell many of these young wooded areas were planted in the last 50-100 years or so, many of them more recently.) Blumberg also explains how there was no proper roads in the land throughout most of the 19th century, while the port facilities at Haifa were, at best, primitive (he describes how passengers and merchants were often dropped off ships many yards from the coast to make their own way through through the surf to the “port”… the rich could afford boats or people to carry them to shore.) Meanwhile, the small towns and cities of Palestine were walled for fear of attack from brigands and especially roving bands of Bedouin, which meant agriculture endeavours were minimal. Despite this desolation, another important point Blumberg expains was how the land, while desolate, was not empty of people, as some Christian Zionists would have us believe. While accurate statistics are notoriously difficult to determine, Blumberg notes the sizes of the main towns and cities and suggests an overall population of around 300,000 across the whole of Palestine around the mid-nineteenth century, a fact which Christian Zionists who argue the land was empty do well to note. The fact is, when the first Zionists arrived, the land was not devoid of a local population, and those of us who support Israel must face and deal with this fact from a satisfactorily theological point of view rather than deny it. This in no way detracts from Israel’s right to exist, as my discussion below will shortly verify. But if we are to take on the opposition and demand they stop peddling myth as fact, then it behoves us to do likewise. This leads me to another point elaborated in Blumberg’s book. The population within 19th century Palestine is mixed and does not comprise exclusively of Palestinian Arabs who were pushed to one side by the early Zionists. A very important point to note here is the existence of a longstanding Jewish community. (In fact, there is evidence for a continuous Jewish community in the land since the fall of Jerusalem in AD 70, albeit not in that city). Blumberg points out how, well before the Zionists arrived, Jews represented a majority within Jerusalem, complete with their own Chief Rabbi recognised and imbued with certain powers by the Turkish overlords. There were also long established Jewish communities in Hebron, Tiberias and elsewhere in the Holy Land. To be sure, Jews were dhimmis with limited rights in Muslim lands compared with the Muslim majority, but nonetheless their presence did not suddenly begin with the first Zionist influx. So when I say that 19th century Palestine comprised of some 300,000 inhabitants, this included the Jewish community, as well as the Turkish overlords who ruled the land as part of the Ottoman Turkish empire, and also the Bedouin who roamed freely. Thus, don’t let anyone ever tell you the Jews came and took the land as complete outsiders. Finally, Blumberg notes how the telegraph arrived in Jerusalem in 1865, putting previously independent consuls in daily contact with their governments in a region where the Great Powers jostled for power and influence, like crouching tigers eyeing a Turkish empire close to collapse. So began an era of internationalised politics. Yet at that time there was very little sense of nation or nationalism in Palestine. The land was ruled by outsiders (the Turks) and not by an indigenous Arab population. Much activity occured within the walled towns and cities, with the Bedouin representing a threat outside. Immigration came later, which included both Jews and Arabs as the land became economically more attractive (arguably as a direct result of Zionist agricultural and economic successes). Ironically, this contributed to an Arab bourgeosie who, joining Arab merchants already in Palestine, gave rise eventually to an Arab nationalism which represents much of the Palestinian nationalist evident today. Meanwhile, the first big Jewish immigration of some 7000 people in 1881 came as a direct result of Russian pogroms against the Jews earlier that year. Most of those fleeing Russia went to the U.S, marking the big influx that symbolised the birth of North American Jewry. Most Jews who came to Palestine were committed to agricultural endeavour which, together with a recently introduced Turkish land registry system, meant they were able to buy land from Arab and Turkish landlords. So in summary, prior to the arrival of the Zionists the land was desolate but not empty. Israel has truly made something of the land, restoring and exploiting it, unlike the Turkish rulers who had permitted it to fall into decay and abandonment. Meanwhile, the Arab population was not initially nationalistically-minded, an ideology which arguably developed later and fuelled by Arab immigration brought about as a direct result of Zionist endeavours. Yet from a Christian perspective, we cannot ignore the Palestinian issue, though I sincerely believe much of the raw deal they have undoubtedly received is a direct result of the incompetence, corruption and lack of genuine compassion displayed by their leaders, together with the Arab world’s refusal to deal with them for a wider political purpose. We should also note there was a longstanding Jewish population (including a majority in 19th century Jerusalem) in Palestine. Early Jewish immigrants were refugees fleeing persecution in Russia, and when they came to Palestine they concentrated mainly on agriculture endeavour, buying land from Arab landlords, often at inflated prices. Thus, they did not come in and steal or take land by force. All these are facts we do well to note when discussing the current Israel-Palestinian conflict. This review was originally posted on the King's Evangelical Divinity School blog.